This section will be regularly updated with various new tips, questions and user-submitted suggestions. Here you’ll find details of the best room locations, tips on how to request your preferences once you’ve decided, making dining reservations, swimming pool hopping, and lots more. Or if you still can’t find the information you’re looking for, why not ask in our Discussion Forums? How recently have the Port Orleans guest rooms been refurbished? When is the next planned work? Are guests permitted to bring pet dogs with them, staying in their room? I’ve decided I want to stay at one of the Port Orleans resorts — but which one should I choose? Help! All of the Room Categories are a bit confusing, how do they work? Are the Preferred Location rooms all within the Alligator Bayou section only, and does every Alligator Bayou room feature a fold-down Murphy bed? Can any other section accommodate five guests? Are Pool View / River View rooms worth the extra money as there are no balconies? What are the best room locations, and how can I make special room requests? There are five people in our group but we’d prefer not to stay in the Alligator Bayou section, can we ask for a Magnolia Bend room? Is it worth doing online check-in in advance? Will it remove my existing reservation notes or faxed requests? I’ve heard that Riverside in particular is quite spread out, what are the walks really like? How far apart are the two resorts? Can I walk between them, use the other swimming pools, or top up my refillable mug? I’ve heard that the free bus service to the parks, especially from Riverside, can have long wait times and sometimes be crowded — what’s the story? There are four bus stops at Riverside, which one is the best for me to use? I want to try some of Walt Disney World’s dining options, do I really need to make reservations in advance? I’m not from the USA, why am I expected to tip extra for meals when I’m already paying the restaurant anyway, including all their staff? And who else should I tip? I’d like to do some general shopping, where is the nearest supermarket, mall, etc? What about local pharmacies or medical facilities, or if I need to see a doctor? How can I contact the Port Orleans resorts, is there an email address? Can I see any of the Disney firework shows from Port Orleans? Note: I’ve also created two simple general-purpose FAQ files, one for each resort, which cover all of the basic questions that people regularly ask. These FAQs are freely available for non-commercial websites to download and use to help their visitors. These files, and their Terms & Conditions, can be found on the Downloadable FAQs page. A new guest room refurbishment cycle has now started, and Port Orleans French Quarter is now complete (July 2018). Work has now progressed on to Riverside, and currently the Alligator Bayou section is being updated building-by-building. See the Refurbishments page for more details. All of the guest rooms at Port Orleans Riverside and Port Orleans French Quarter were refurbished a few years ago to feature brand new decor, flat-screen TVs and two Queen Beds instead of the old doubles (or one single King Bed if you have booked that option). All of the Alligator Bayou rooms, including the King bed rooms, now feature an extra pull-down Murphy bed (child sized, approx. 63" x 30") instead of the old trundle bed. Work commenced on refurbishing the Port Orleans French Quarter guest rooms on Monday 1 November 2010, starting with building 7 which three weeks later was reported to be complete and ready to accept guests. On Friday 15 April 2011 the final building (number 3) was completed and rededicated, meaning that the whole of French Quarter had newly renovated rooms. Work then started on the Port Orleans Riverside area on 26 June 2011, starting with the rooms in Acadian House. By September 2011 both Acadian House and Magnolia Terrace had been reopened with newly refurbished rooms, and then Alligator Bayou lodges 14, 36, 37 and 38 were completed just prior to Christmas 2011. During the first four months of 2012, all 512 rooms in Oak Manor and Parterre Place were refitted to the new “Royal Guest Room” theme. Oak Manor reopened on 9 March (slightly delayed from 17 February, see our news pages) and Parterre Place reopened on 13 April. Note: these are the only two buildings at Port Orleans which contain Royal Guest Rooms, and they all feature two queen beds (no Kings and no extra pull-down beds). Finally, the remainder of the Alligator Bayou lodges were completed, starting with building 24 which closed for refurbishment on 15 April. The last building to be completed was 26, which reopened to guests on 1 August 2012. Guests staying at Riverside are allowed to bring up to two dogs with them, staying in their room. There are no size, weight or breed restrictions, but they must be properly vaccinated. Port Orleans French Quarter is not included, and pets (other than service animals) are not allowed in that resort. To register to bring your dog(s) on your upcoming visit, please call 1-407-939-7539. Each guest room participating in the program will have easy access to outdoor pet walkways for exercise and green spaces with pet relief areas. Initially all accommodation categories at the resort were intended to be dog friendly but that was quickly restricted to primarily Standard and Garden View rooms, with the intention of using building 24 where possible. If a guest booking cannot be accommodated in building 24, guests with dogs will predominantly be assigned to building 15 (Preferred Location) and the end-wing sections of Acadian House (80) or Parterre Place (95). This should help maintain other sections of the resort as relatively animal-free for the benefit of guests with allergies, etc. Guests are permitted to take their dogs with them around most of the public areas of the resort as long as the animals remain well behaved and on leashes, with the exception of Food & Beverage locations and the fenced pool decks. Guests must sign a waiver which explains where pets can go, responsibilities of the owners, etc. A copy of this document can be DOWNLOADED HERE. There is a $50 per night per room fee for guests who bring a dog (or dogs) with them. This is partly required to provide for more intensive cleaning of the room after departure. Guests will get an amenity package delivered on check-in day with various items for their pet. “Pluto’s Welcome Kit” includes mat, bowls, a pet ID tag, courtesy plastic disposable bags, puppy pads and dog walking maps. Guests will not be able to receive housekeeping service while there is an unattended dog in the room, and a Pluto “Do Not Disturb” door hanger will be provided to indicate to hotel staff that there is a pet present. The other properties where dogs are accepted are Art of Animation, Fort Wilderness Cabins, and the Yacht Club (the nightly fee at the Yacht Club is $75). Other animal facilities — including dog walking, day care and other pet services — are available just over the road from Riverside at the Best Friends pet care facility. For details, please call 1-877-4-WDW-PETS (1-877-493-9738), or visit www.bestfriendspetcare.com. Pet merchandise is available at participating resorts. Any other guests who express a wish (for example on medical to be located away from dogs will be assigned a room as far away as possible from those original four designated areas. For more information, including for making booking and for other restrictions and policies, guests should contact 1-407-W-DISNEY. Trial Program Update on 18 October 2017: So we are now a few days into the trial of the new Dog Friendly Rooms policy, and the public outcry on social media and via communications directly to Disney has taken everyone by surprise — it even took me aback, and I know how vocal Disney fans can be. I think it’s safe to say that Disney completely underestimated the passion that many people would have on this subject, and the initial plans are being modified and policies rewritten on the fly at the moment. This process will probably remain fluid over the next few weeks, and Disney is closely monitoring and listening to the feedback and will continue to adjust procedures to try to make this trial work for everyone. Initially, as will have been seen from the printed Dog Relief Area maps, it was intended that all these happy fluffy pets (which everyone would surely like) would be permitted in any type of guest booking at Riverside, and the early announcements did state that the whole resort — barring certain areas such as food & beverage and swimming pools — would be canine accessible as long as the animals were kept under control and on a leash. However over the last 48 hours that intent has been severely trimmed back and they are now aiming to try to restrict dogs to only Standard and Garden View rooms, and the current intention from the room inventory department at Riverside is to use building 24 as much as possible for any guests who book to stay with their pets. This building is well away from the common areas, is located right next to the parking lot to make getting pets to and from rooms easier, and has a nice grassy area nearby to allow dogs to be exercised. However, although the telephone Reservations Center is now advising guests who wish to bring dogs with them that this will only be possible for Standard and Garden View rooms, the initial announcements — and even the currently posted wording on the Disney website — do not require guests to book that way, nor to preregister their dogs. Thus it is entirely possible that people who have booked for other room categories using the Disney website, via travel agents, through Expedia, etc. will simply show up at the front desk accompanied by their pet(s) and ask to pay the daily fee. This could mean that, in the short term at least, dogs will still need to be accommodated in other areas of the resort in order to comply with existing bookings. This will of course be closely monitored and subsequent deep-cleans arranged for any affected rooms, but at this stage it cannot be guaranteed that other areas of the resort will remain completely dog-free. I have reached out to my contacts at the resort who have said that so far (i.e. in the first three days of the program) they have not yet had a single dog staying at the resort. Over the next seven days there are currently just four one-night reservations with associated comments indicating that the guest plans to bring a dog with them, against more than 100 comments over the same seven day period asking to be assigned to a room away from the dog friendly areas. Those four one-night reservations are apparently all from local Florida residents, and personally I would not be at all surprised to find that some or all of them turn out to be from social media aware guests, or even bloggers or website owners, testing out the new policies for themselves. If there have been any booking cancellations because of this new policy then they have already been replaced with new reservations, as Riverside is either sold out or very close to it for the rest of the month. Trial Program Update on 21 October 2017: A copy of the waiver document which guests need to sign when they check dogs in to the hotel can be DOWNLOADED HERE. So far, the room assignment department at Port Orleans Riverside has not been given any specific directions from Walt Disney World management to indicate that they should enforce the accommodation of all dogs into building 24 only, so they are still expecting that existing booking for other room categories will be assigned to one of the original four dog-friendly areas (buildings 15, 24, 80 and 95 on the map). Building 24 will definitely be their preferred choice wherever possible though. For example, if a guest had booked a Royal River View Room room six months ago, and they now state that they wish to bring a dog with them, they will be assigned a room in building 95 close to the originally marked Dog Relief area on the Dog Friendly Locations map. Similarly, someone who originally booked a Preferred Location room would be placed in building 15. Any guest who has expressed a wish to be located away from dogs will be assigned a room as far away as possible from those original four designated areas. As far as common areas go, at the moment dogs will be permitted - under control and on leashes - in all common areas of the resort except for Food & Beverage locations (such as Boatwright's Dining Hall, the food court and presumably the River Roost Lounge) and the fenced pool areas. The lobby and even merchandise shop are fine, as are all the public pathways. This policy is covered by the wording in point 12 of the waiver document. The maximum seven hour 'alone-time' rule will be mostly left to guests' honesty, but in cases where there is concern the electronic door-lock system can be interrogated remotely to prove how long a room has been left unattended. Similarly, Disney are aware that there may be situations where the required 30-minute return time to attend to a barking dog may potentially be difficult to enforce when guests are away from the hotel. The first thing you need to know is that all of Port Orleans is lovely and you certainly won’t be disappointed with whichever section you finally decide to book. That said, what are the main differences? Port Orleans French Quarter is relatively small (around 1,000 rooms) and fairly formally laid out with pleasant three-story buildings set along pretty New Orleans styled streets and alleyways. That can make it a bit easier to get around, plus the resort has a very cute dragon themed slide at its pool which some kids really enjoy. The room interior decor is quite fancy and ornate for a Moderate. The resort features one swimming pool, a shop, a food court and a single central bus stop (which can sometimes share buses with Riverside, but generally not during peak times). Port Orleans Riverside is much bigger (over 2,000 rooms) but also has a lot more facilities — a larger food court and shop, a full table-service restaurant, bike rentals and more activities such as fishing, horse-drawn carriage rides and boat tours, one large feature pool with a longer/faster slide, five more smaller swimming pools, plus one central and three extra outlying bus stops. Alligator Bayou: Sixteen two-story lodges (64 rooms in each building, with no elevators for the upper floor) sit in a lushly wooded area and are quite spread out, with secluded rooms that have a laid-back rustic theme (with wood-hewn bedposts and furniture created to evoke the theme of packaging crates, for example). This is the only area at Port Orleans that can accommodate groups of five people. Magnolia Bend: Four much larger mansion buildings (256 rooms in each) are set in more formal ornamental gardens and feature fancier, more ornate room decor — rather more akin to the French Quarter section. This is the only section of Riverside that features elevators, which are located in the central three-story section of each building. Many people prefer the charm of the rather more secluded Alligator Bayou area, but there are also those who comment that the rustic theming feels somewhat “basic” and they prefer the comparative plushness of the Magnolia Bend rooms. Booking a Preferred Location room will guarantee you a room within the Alligator Bayou section, as will booking for a party of five people in one room. If you want to book one of the new themed Royal Guest Rooms, these are all located in the Magnolia Bend section of Port Orleans Riverside, and are a separate booking category (not just a request). Please see the Royal Guest Rooms page for more details. The actual amenities included inside all of the guest rooms are pretty much the same in all of the sections — see the Rooms page for full details — only the theming of the decor and the design of the fittings changes. The only notable difference is that the Alligator Bayou section officially sleeps up to five people as they feature an extra fold-down Murphy bed (child or small-adult sized, approx. 63" x 30") over a bench seat. King Bed rooms in the Alligator Bayou section can thus accommodate up to three people. One other minor difference is that the Royal Rooms do not feature a ceiling fan. Although the bus service is normally shared between the two resorts, French Quarter’s single bus stop can sometimes give time and convenience advantages over Riverside’s four stops, especially at busy times or when separate services are being run for each resort. At very busy times it is not uncommon to hear of buses arriving at Riverside with standing room only after having already picked up at French Quarter. When this happens Disney quickly add extra buses to the route, but some guests can be inconvenienced in the meantime. If you still can’t decide, perhaps it would help to boil the choice down to a really simple one: French Quarter is smaller and more intimate but with less facilities, whereas Riverside is larger and more spread out, but with more varied landscaping and a lot more to see and do. Personally, as I get asked this a lot and for what it’s worth, I prefer Riverside over French Quarter for the wider range of facilities and more varied and lush environment. I’ve stayed many times in both of its sections, and although Alligator Bayou was my ‘first love’, I now enjoy alternating with Magnolia Bend on different trips, as both areas have their own unique charms. Proximity to other features (main building, bus stops, pools, etc) is probably a bigger consideration for me than mansions vs. bayou. Port Orleans French Quarter and Port Orleans Riverside are ‘sister’ resorts in that many of their services operate under a common operational structure and they share a number of facilities. They even used to have a single General Manager overseeing both resorts until 2016. Although they may appear to be some distance apart on a map or when you’re driving or taking the bus, in fact the dividing line between the last building of French Quarter (Building 7) and the first of Riverside (Parterre Place) is merely a narrow road bridge. It’s a very pleasant short walk alongside the Sassagoula river bank between the two resorts, and you can comfortably stroll the 900 yards from one food court to the other in around 10 minutes. Other options include taking the Sassagoula Water Taxi which runs every 20 minutes or so and takes around five minutes to travel between the two docks. You could even use the Disney buses as some of the bus services call at both Riverside and French Quarter — but do check with the bus driver first, in case the bus you are trying to catch is going straight on to its final destination! Because the two Port Orleans resorts are linked, anyone staying at either resort is able to use all of the facilities at the other — including (unusually for Disney hotels) the swimming pools. Indeed, the walk between the two main feature pools is just 985 yards should you wish to try them both out in one session. There is probably more incentive for guests staying at French Quarter to travel over to Riverside though, as many of the major facilities are located over at the somewhat larger Riverside resort. These include the only table-service restaurant (Boatwright’s Dining Hall), cycle rentals, evening horse drawn carriage rides, the fishin’ hole and the five “quiet” leisure pools. On the other hand, the French Quarter food court is the only place to get beignets! And yes, you can purchase a Rapid Fill refillable mug from either the Riverside Mill or the Sassagoula Floatworks & Food Factory and get unlimited hot or cold drink refills from beverage dispensers at any of the resort food courts within Walt Disney World for the rest of your current stay. You cannot use your mugs to get free refills in the theme parks though. There are currently ten room categories available at the Port Orleans Resorts (increasing to 12 for 2019) priced with varying nightly surcharges above the standard rooms. See the Room Rates page for the current pricing structure in detail. Yes, ALL of the Preferred Location rooms are within the Alligator Bayou section of the resort, and only within buildings 14, 15, 18 and 27 of that section. There are no Preferred rooms in the mansion buildings or at French Quarter. Note: a few of the rooms within those four buildings actually fall into other booking categories, such as the River View rooms in buildings 14 or 27, and any of the King Bed rooms, and those need to be booked under the appropriate category rather than Preferred Location. See our floorplan maps to see which rooms fall into which booking category. Secondly: Yes, all of the Alligator Bayou rooms (including the previously mentioned Preferred Location rooms) feature the fold-down Murphy beds allowing that section alone to accommodate up to five guests. So if you have a party of five people (all aged 3+) then you will automatically be assigned to an Alligator Bayou room rather than the mansion buildings area. The fold-down beds are even included in the King Bed rooms in Alligator Bayou incidentally, and they can thus sleep up to three people. There is one caveat to the above rule though, which is that the modified Wheelchair Accessible rooms need to have an extra wardrobe within the bedroom area in order to provide clothes hanging space. This wardrobe is too bulky to allow installation of a fold-down bed, so those rooms can only accommodate up to four guests. While it is very unlikely that you would be assigned one of the small number of Accessible rooms by chance, it can occasionally happen when the resort is very full. So if you have a Preferred Location booking and really want the fold-down bed, it’s worth mentioning that in your pre-arrival requests, just in case. Opinions vary tremendously on this one. You have to remember that the Moderate resorts have no internal corridors so you access your room via a shared outside walkway which runs all the way around each building. This means that you don’t have your own private balcony outside your room and many people say that it’s therefore pointless paying extra for a view which they feel you can’t sit and enjoy. Some people even keep the curtains fully closed while they are in the room in order to prevent any occasional passers-by from glancing in — although to my mind that rather defeats the object of having a window in the first place. My own opinion (for what it’s worth) is that the outside walkways rarely serve more than about a dozen rooms before the next access point, so they are never very busy and there isn’t enough foot traffic for it to become a worry — especially on the upper floors. You can also angle the blinds slightly so that you can still see some of the view, but preventing people who are walking past the room from accidentally looking in. It is also possible to create a kind of “poor man’s balcony” using the recessed alcoves outside the doorways. 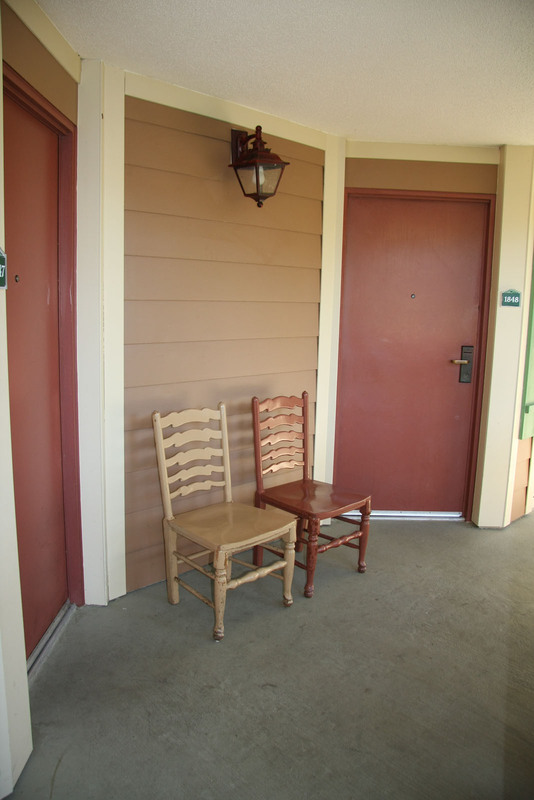 It’s not uncommon for guests to take their room chairs outside in the warm Florida evenings and enjoy a pleasant glass of wine on their “patio”. Just be prepared to make way politely if someone comes along with a double-stroller after a long day at the parks — or why not offer them a drink! Riverside River View: These rooms all overlook the riverbank pathway which runs all the way around Ol’ Man Island. None of them have long walks to either the feature pool or to the main buildings — indeed, some of the River View rooms in buildings 14 and 27 are even more conveniently located than rooms which are sold under the Preferred Location category. Royal Room Pool View: Almost all of these rooms are in Oak Manor (plus two in Parterre Place) and are all very near to the footbridge leading over the river to the main buildings and the South Depot bus stop. They are also quite close to the East Depot bus stop. As there are no Preferred Locations in the Royal buildings, this is the best option for guaranteed convenient access from a Royal Room. French Quarter Pool View: These rooms are all located within buildings 2 and 5, and so are some of the most centrally located rooms for easy access to the main building and the boat dock (not to mention the pool of course). Garden View vs. Standard View: Almost all of the Standard View rooms overlook parking lots, and while there are lots of trees and other vegetation to partially obscure an otherwise concrete outlook, a Garden View room assures you of a much more pleasant ambiance when you step outside your room. Please see our detailed pages on Room Categories and Locations and Making Special Room Requests. Please remember that any room requests are just that, requests. Disney cannot guarantee to fulfill any special requests apart from medical requirements. If you’ve got any comments about your favourite room locations, or regarding your experiences in getting special requests fulfilled or otherwise, please let us know via our Discussion Forums. Personally, yes I do suggest doing online check-in via the My Disney Experience website at any time up to 60 days before your arrival. Provide as much information as possible to help reduce the amount of time that needs to be spent at the Front Desk (if any) and if you have already made special requests via your original booking then leave the extra request tick-boxes empty. Think carefully about your choice of whether you’d prefer to try to have your requests met (even if that may mean some waiting) versus simply getting a ‘ready room’ as soon as you arrive, but which might not be in quite such an ideal location. However, if you are planning on sending a faxed request too, make sure that you do the online check-in BEFORE sending your fax. At the resort, online check-in really only starts to differ from regular check-in a few hours before your stated arrival time. A cast member processes all the online check-ins in batches, and creates welcome packs ready for guests who are imminently due to arrive at the Front Desk. If a room as been ‘blocked out’ in the system already — perhaps based on an earlier fax, or if it’s a group booking — then you should still get that room, even though there may be a wait if it has not yet been cleaned and made ready. Otherwise, they will check through any previously noted requests first and then pick as suitable a room as they can find from the pool of available rooms at that moment. Then, when you arrive, the Front Desk team will generally be able to process your checkin a lot quicker than if you just turn up — in fact, during peak hours they sometimes even catch people in the lobby before they even join the line, and check them in via iPads. There is now also an optional “Direct to Room” facility provided for guests who have completed the full online checkin process and received their Magic Bands by post, making it possible to go directly to the assigned room upon arrival without visiting the Front Desk at all. See the Magic Bands and Online Checkin page for more details. Finally, if you really don’t like the location of the room you’ve been assigned, you can always ask the Front Desk to check again to see if anything better has become available in the meantime, or even offer to wait for another room to be cleaned and be made ready. Although French Quarter is nicely compact and probably the easiest of all the Value or Moderate resorts to get around, the furthest rooms in Riverside can indeed be a bit of a trek from anywhere — although there are some rooms, such as those in Alligator Bayou 14, which are literally steps away from the food court door. The ability to book a Preferred Location room (located in Alligator Bayou only) is a major advantage for anyone who wants to really cut down on walking distances, but if you prefer the other themed sections then a River View booking would tend to help, as the river cuts right through the middle of the resort. Acadian and Magnolia’s best routes are walked via Ol’ Man Island, Oak and Parterre’s are via the alternative bridge just to the south of the marina. The Alligator Bayou routes, even from the northernmost locations, are slightly shorter along the riverside pathway instead of cutting across Ol’ Man Island. The best-case distances are generally from River View rooms, while the worst-case distances are from the more remote Standard or Garden View rooms. So, based on an average walking speed of 3mph — and assuming you don't get lost or stop to smell the roses en route, both of which are quite possible — that gives the shortest Magnolia Bend walks to the food court at about 2' 45" and the longest ones at around 5' 40". Walks from Alligator Bayou to the food court vary from a tiny 45" to about 6' 40". For Parterre Place, the South Depot is almost always closer than the East Depot. The walking distances within French Quarter are significantly shorter than Riverside, with the minimum distance from a guest room to the food court being about 20 yards and the maximum (from the far end of building 1) only being 350 yards, a four-minute walk. Prior to the closure of the last few double-bedded rooms in the Magnolia Bend mansion buildings it was possible to request a wheeled fold-up ‘roll-away’ bed for a fifth person, or to allow two older children to avoid having to share the same bed, but now that the refurbished rooms include new, slightly larger, queen beds this facility has been withdrawn as from Sunday 11 March 2012. It is no longer possible to have five people allocated to any of the mansion building rooms (including the new Royal Guest Rooms) unless that fifth person is a toddler under the age of three. The same has applied to the refurbished rooms at French Quarter for a while. Alligator Bayou is now the only section of Port Orleans which includes an extra bed to accommodate a fifth person in one room. The newly refurbished rooms all now include a pull-down Murphy bed (child sized, approx. 63" x 30") over the banquette bench seat. The new pull-down beds also feature in the updated King Bed rooms incidentally, which means that they can accommodate up to three people (and this is now a bookable option as from May 2013). Some people suggest taking an inflatable bed (single size, aka twin air mattress) in order to provide somewhat more flexible family sleeping arrangements. An air mattress of this type should fit into the new queen bedded rooms, but unfortunately you still cannot have more than four people (plus an infant) officially assigned to a non-Alligator Bayou room. Walt Disney World has more than 70 table service restaurants spread around the theme parks and hotels, plus any number of counter service and snack-food locations — surely it can’t be that difficult to eat on the spur of the moment can it? Well, that used to be the case a few years ago but recently Disney has introduced their “Disney Dining Plan” which effectively enables guests to prepay for all their meals for the duration of their stay. This means that there is now a large number of people who have already paid for their food before they even set foot in the resort and naturally this has created a massive increase in demand, especially at the full service restaurants. To make this situation even worse, during otherwise slower times of the year (for example mid-August/September) Disney has started offering the Dining Plan for free to accompany certain types of resort booking, and at these times the better restaurants can get booked solid many months in advance. While it may still be possible to walk up to some of the less frequented locations at off-peak meal times and get a table, if you want to eat in any of the more popular restaurants at anything close to a normal meal time, it has unfortunately now become essential to make reservations in advance. If you try walking up to somewhere like the Le Cellier steakhouse in Epcot, or character dining locations such as Chef Mickey’s at the Contemporary Resort, they will most likely tell you they have absolutely no availability for several weeks to come. Luckily, making Advanced Dining Reservations (or ADRs) is very easy. The simplest way is to do it online using the WDW Dining Reservations site or the My Disney Experience app, where you can see availability based on date, time and group size and then make your reservations (which can be linked to your hotel booking as long as you are logged in to your Disney account when you make the booking). You can also call Walt Disney World on 1-407-WDW-DINE (1-407-939-3463) and tell them where and when you would like to eat and they can do it all for you. Tip: if you can’t find the location and time you want, try modifying the time a little, or adjust the size of your group (e.g. try looking for a table for 4 rather than 2 or 3). ADRs can be made up to 180 days in advance of your planned dining date. Disney hotel guests also have an extra benefit of being able to telephone 180 days prior to their arrival date and then book restaurants for the whole of their stay, up to a maximum of ten more days. You may see this referred to as simply “180+10” on many websites, but remember that the +10 rule is based from your resort arrival date. To do this online, you will need to have your 12-digit hotel confirmation number available. Recently, Disney has made several improvements to the system which have made it somewhat easier to book at the more popular locations. First, the booking system will now try to prevent one person (or at least one login) from booking multiple restaurants at the same time, which some people try to do in order to leave their eventual options open. Also, you now need to provide a credit card guarantee at the time of booking. You can still cancel at any time up to one day before the meal, but if you simply don’t show up then you will be charged a $10 per person fee. Finally, some signature restaurants require two Dining Plan credits for one meal now, which has somewhat reduced the overwhelming demand at the Le Cellier steakhouse in Epcot’s Canada for example. So please don’t assume that you can just wait until you check in at Port Orleans and then decide your dining choices for the week, or you may end up disappointed. It may not be as spontaneous as it used to be but unfortunately, with demand so high, you either have to plan a little or accept that most of your Disney meals will be counter service or fast food. I’m not from the USA, why am I expected to tip extra for service when I’m already paying the restaurant, who pay the servers anyway? And who else should I tip? To explain this, you first need to understand the way that restaurant and bar serving staff are paid in the USA. Unlike for example in the UK, American staff are only paid a minimal amount by the restaurant or bar for them to turn up for work. Their ‘real’ living wage is paid directly by the customers, cutting out the middle-man so to speak. This is one of the reasons that some foreign visitors — especially us Brits — comment that menu prices in the USA are a bit cheaper than at home (where staff wages are normally included in the meal cost). A tip of between 15% and 20% of the pre-tax meal or bar bill is generally accepted as normal in most of the USA, and Disney list calculated figures for both an 18% and a 20% tip on every receipt. If you are on a Disney Dining Plan, or using the Tables in Wonderland card, an 18% tip will be automatically added to your bill (based on the original meal cost prior to the dining plan deductions) which you will pay along with any other non-plan items, etc. If you happen to receive bad service, it’s best to still leave some sort of nominal tip (e.g. $1) to indicate that you are not simply an “ignorant Brit” who does not know how to pay for service, but that you are specifically commenting on poor service. You can of course also tip a bit extra for exceptional service too, much like you would in the UK. If the actual food is poor, please take it up with management rather than penalising the serving staff. All of this only applies to table-service meals and drinks at bars/lounges though, you don’t need to tip at all for quick/counter service, and you can tip a smaller amount (perhaps 10%) for a buffet meal. At bars, $1-$2 per drink would be acceptable rather than a percentage. Taxi drivers should be tipped at around 15%-20% of the fare too, and baggage porters should be tipped at $1/bag. Room housekeeping at Disney is considered an optionally tipped position, but an amount of $1 per guest per night is about normal (do this daily, as your housekeeper could change with modified rotas, days off, etc). I always find it strange that we Brits in particular don’t seem to have a problem about being asked to drive on the right-hand side of the road when in America, or having to use Dollars rather than Pounds to pay for our US purchases — so why should a different method of paying wages to wait staff in restaurants create such confusion and heated debate? This is one of the most common criticisms levelled at the Port Orleans resorts, particularly as their size and popularity means a lot of guests want to use the service. However it’s also one of the hardest to get any definitive information on. For every online posting saying “we had to wait over an hour for a bus, not everyone could get on, there was a virtual mutiny at the bus stop” there are just as many people who say they stayed at Port Orleans for two weeks in July and never experienced any problems with the buses. While serious complaints are admittedly rare, there does seem to be a worrying element of inconsistency regarding the bus service. Suffice to say that waiting for an hour is NOT the norm — if it were, the Disney complaints department would be mobbed by now. Ideally you should never have to wait for more than 20 minutes for a bus to anywhere, and often a good deal less. Disney tracks all of its buses by GPS and can adjust the services and the routes according to demand. They can also add extras buses at short notice to cater for peak times. However, no matter how good any bus service might be, there are going to be certain times of day when long lines are simply unavoidable — the most obvious being when an entire park-full of guests tries to leave at the same time (after a closing fireworks show for example, such as Wishes at the Magic Kingdom or Illuminations at Epcot). My own advice is to try to avoid being there at these busiest times, by either exiting before the end of the fireworks or just hang back in the park and enjoy the sights or do some shopping for a while to allow the worst of the crowds to disperse before you exit. For specific information about the routes that the buses take, the various stops available, and details of where and when the two resorts share a combined bus service and when French Quarter and Riverside provide their own separate direct services, please see our Bus Service page. And one last thought before you rush online to post questions asking for people’s experiences with the buses: imagine you have been waiting 40 minutes for an Epcot bus, and when one finally turns up someone else happens to stroll up to the bus stop and just hops straight on with no wait. You’re both riding on the very same bus, but while they are going to tell all their friends how wonderful Disney’s buses are, you might have a somewhat different story... The truth, as ever, lies somewhere between the two experiences. For all of the theme park buses the West Depot is the first pickup, and the South Depot is the final pickup before the bus heads off to the park. The Disney Springs buses work slightly differently, with South picked up first, then the circle route and East last. The plus side of South is that it’s the quickest and most convenient stop to use if you are in a hurry to get to a theme park, as once you get on the bus it goes directly to the destination with no further stops. The downside of South is that the bus will most likely have picked up at three or four stops on the way, so getting a seat could be more difficult. Indeed, sometimes when there are a lot of people waiting not everyone at the stop will be able to get on the first bus at all if it is already packed. The parks do send out extra buses at peak times to help alleviate that issue though. Coming back from the theme parks, South is usually the last drop-off so you might want to consider getting off at one of the earlier stops. Even if it might be a longer walk for some rooms — which might not be what you want if you are tired — it could get you back to your room sooner. From a Preferred Location room, the South Depot is your closest bus stop — in fact, that proximity is one of the things that you are paying the extra money for. Many of the other Alligator Bayou buildings are closer to the West or North Depots, but check the map to see which is best for you. For the mansion buildings, many rooms (especially those nearest to the parking lots) are closer to either the North or East Depots, while Royal Rooms are mostly closest to either East or South (the latter via a footbridge across the river). Do remember that the mansion buildings are pretty big, so it depends on exactly where in the building you happen to be located as to which is your closest stop. Please see the food shopping and malls sections of our Local Shopping and Other Services page. Please see the medical section of our Local Shopping and Other Services page. Sorry, there are no direct email addresses for use in advance by guests of any of the Walt Disney World resort hotels, with the sole exception of guests staying in the Concierge level rooms at the Deluxe hotels. The only way to contact any department at Walt Disney World by email is to use the main Guest Relations address, wdw.guest.communications@disneyworld.com, and wait for them to find the answer to your question and respond — but that could take a while! You can telephone, fax or write to the hotels though, and all the contact details are given in our main Riverside and French Quarter information pages. However please be aware that when you telephone the resort (and also when you call the Front Desk from your hotel room phone) you will be answered by a central Walt Disney World switchboard which is NOT located at the resort itself. The operators there can answer a good many general questions on behalf of the resort, and even access the hotel’s computer system, but if your enquiry needs to be answered specifically by someone who is on-site then you’ll need to ask to be connected directly to the resort. Fax messages are received directly by the back office staff at the resort though. As from February 2018, the in-room Welcome Letter from new General Manager John Berko provides a dedicated email address, WDW.GM.PortOrleans@disney.com, for guests to pass on feedback and comments about their stay. The letter assures guests that every email received will be read and personally responded to, either by John or one of his team. This does not appear to be an open email for general pre-arrival questions or requests though. Not really in any great detail, as the theme parks are too far away and the trees tend to obscure the view. You can glimpse and hear the higher bursts of the Illuminations show over Epcot at around 9pm and sometimes Wishes from the Magic Kingdom, but you won’t be able to hear the music or see any of the other show elements which rather defeats the point. The best views (such as they are) would probably be from the upper floor rooms overlooking the parking lot in the northern section of French Quarter — such as buildings 4 or 7.